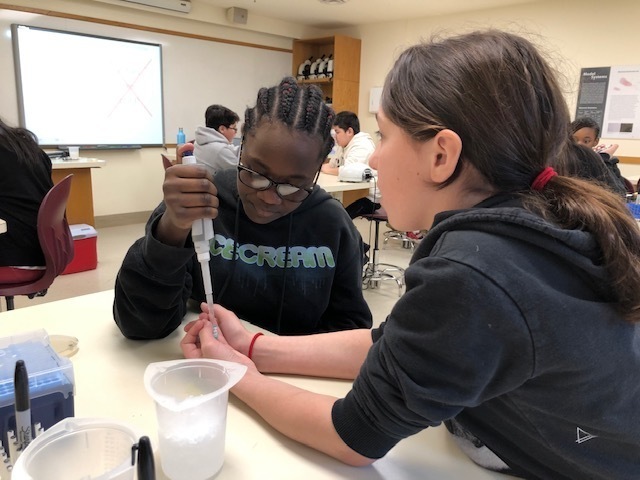 Throughout the week of March 25th, Grade 6 students traveled to the Cold Spring Harbor Laboratory to take a dive into the wonderful world of DNA. To begin the experience, students solved a forensic mystery by collecting and analyzing various types of physical and DNA evidence. By conducting DNA sequencing comparisons, students ultimately decided the validity of the claim of Anna Anderson, who presented herself to the world in 1922 as Anastasia Romanov, the youngest daughter of the last Russian Tsar. Following the forensic activity, the students were able to experience a hands-on experiment involving the use of micropipettes, ice baths and Petri dishes to inject harmless bacteria with the DNA of a jellyfish to grow glowing bacteria. Students were engaged as they collaborated to utilize scientific equipment to perform the experiment in small groups. Thank you to our Grade 6 teachers for organizing this scientific leaning experience for our students!